There are two little pedestrian spaces off the long straight length of the Sydney Road shopping strip. 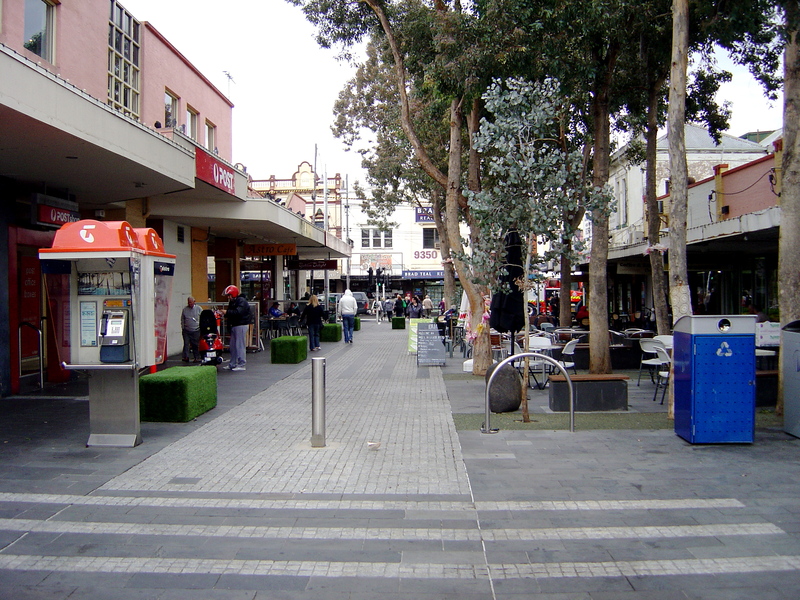 These two urban hubs are Sparta Place in Brunswick and Victoria Street Mall in Coburg. Sparta Place has some great aerosol walls, yarn bombing, sculpture and fashion boutiques and a cafe. Victoria Street Mall has yarn bombing, sculpture, cafes, post-office and public library. In both malls the public art, in both cases sculpture and street art, has accreted rather than incorporated into the design. These two malls were first designed and created by the Moreland City Council but then the public and surrounding businesses have added to this design. Just as the trees planted in them have grown these malls have changed over time. Three different groups are struggling for control of Sparta Place. There is the Moreland City Council urban design team who did the initial change to a pedestrian space in 1998. Maria Hardwick as a business owner invested heavily in renovating the old building gentrifying it to opening fashion boutiques. 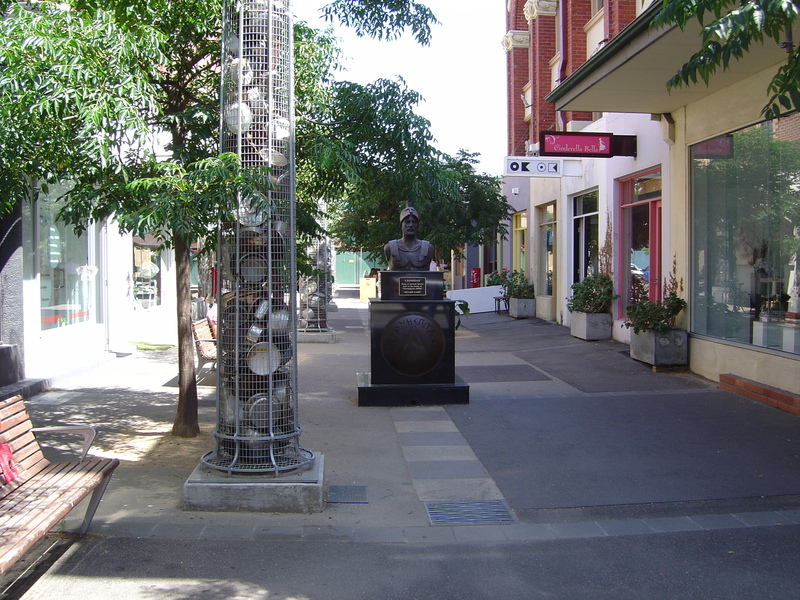 The five metal columns full of post and pans, “New Order” by Louise Lavarack have a post-modern approach to classical references. 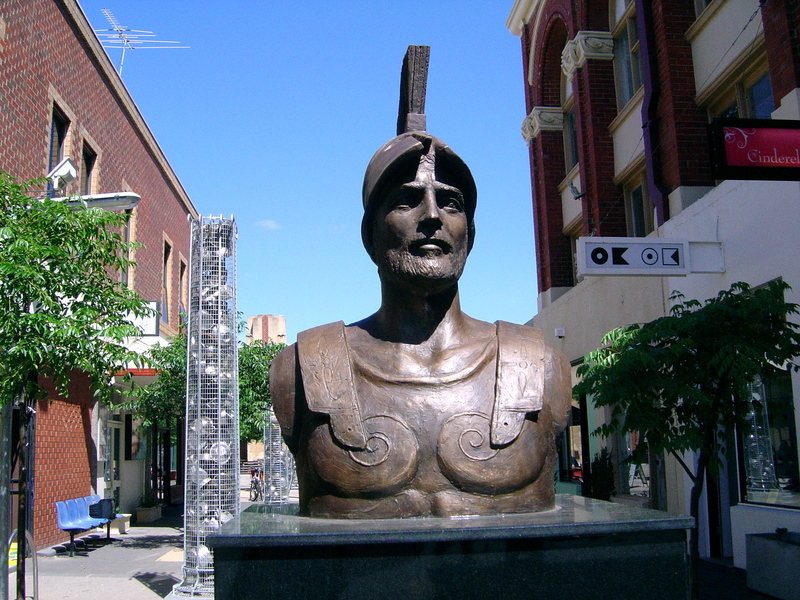 But some of the residents of Brunswick and their council member wanted a memorial to Sparta to celebrate the relationship between Moreland and its sister city in Greece (one of Moreland’s many sister cities) with the statue to King Leonidas and they got in 2009. Sparta Place has the architectural attractions of the Hardwick building and the Spanish revival building at the end of Sparta Place. The dappled shade of the trees, benches with yarn bombing, the shop signs unfolded on the pavement that emphasize the middle path through the mall. At the carpark end of the mall quality street art on the large walls adds to the sense of place. 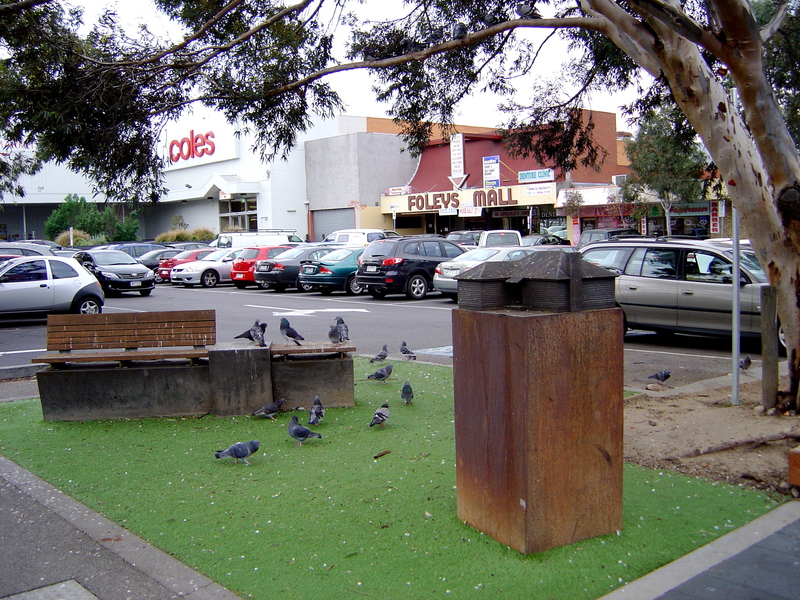 Local people do use Sparta Place to sit and talk, although it is not as successful an urban space as Victoria Street Mall in Coburg. The old men who come regularly to Victoria Street Mall to sit on the long bench by along the glass wall of the library make it an institution. But there is a social balance in the ages of people using the mall from the very young to the very old and this is important in this time of age segregation. There have been recent improvements to Victoria Street Mall with new water permeable cover around the base of the trees, replacing the area that was covered with heavy sand that quickly spread across the paving. The seats have been covered with an artificial turf giving the Mall a quirky and fun design feature. The style has become funkier along with the yarn bombing and other community art projects. Board-games have been added to the large public table that is now located at the library end of the mall – not that I’ve seen anyone playing them yet although this public table (in a mall full of private café tables) is still well used. At the corner of Victoria Street and Waterfield Road there is a small bronze house with a corridor with a corridor going straight through it. It is simplified but typical of Australian houses in Coburg. It is “Dwelling” by Jason Waterhouse, the winner of the 2005 Moreland Sculpture Show. Waterhouse has been making sculptures of this basic house form for a number of years in various media. At other end, the Sydney Road end chuggers and buskers compete for the passing trade. These two malls are urban nodes. Nodes are those points of interaction in urban environment that link various paths. The public perceives and navigates the urban space, in a graduated scale from a path, edge, node, to a district. 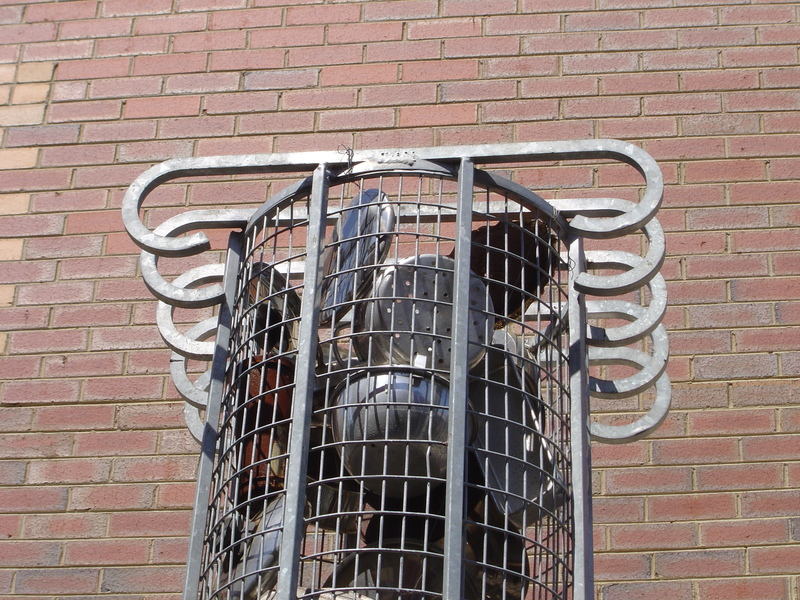 Public art and sculpture is used to mark the edge of a path or as part of the design of a node. Apart from these two malls poor urban design of nodes in far more typical in Coburg. Coburg’s historic railway station is still not working as a node even after the recent renovations to the station’s forecourt. All of the hubs around any of the railway stations in Coburg and Brunswick are badly designed; the local councils and the railways department don’t appear to be able to communicate. This entry was posted on Monday, July 8th, 2013 at 8:34 PM	and tagged with Brunswick, Coburg, fashion boutiques, Jason Waterhouse, King Leonidas, Louise Lavarack, Moreland City Council, sister city, urban hubs and posted in Architecture, Coburg, Public Sculpture. You can follow any responses to this entry through the RSS 2.0 feed.